This week’s report highlights in particular the growing use of life bullets and serious injuries in protests against Israel’s occupation policies across the West Bank. Again almost sixty invasions have occurred in the West Bank while fishermen are still the main target of Israeli attacks on the people in Gaza. 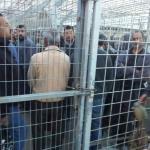 The arrest of 43 Palestinians - amongst them 10 children and 3 women - as well the summoning of 14 Palestinians to be interviewed by Israeli Intelligence. The destruction of 20 dunums of agricultural land and the uprooting of 60 trees west of Bethlehem. Exercises by the Israeli occupation forces burnt 10 dunums in Aqraba, south of Nablus. The destruction of dozens of olive seedlings behind the Wall in Salfit area and the destruction of tents, east of Yatta. The razing of 10 Dunums and the confiscation of a tractor and harvesting machine, south of Nablus. The uprooting of forest trees east of Tubas. The establishment of many flying checking points in the West Bank, impeding the movement of Palestinians citizens and traffic. Israel continues it crimes against the Palestinian people as part of the policy of collective punishment in violations of all international conventions. The continuation of the illegal siege in the Gaza Strip is part of this policy. Israeli occupation forces have continued to shoot and raid Palestinian cities, villages and refugee camps by using force against the human rights defenders who have taken part in protests against the use of aggression and growing settlement activity in the occupied territory. In the West Bank, the Israeli occupation forces killed Abdullah Ayad Abdullah Hamayel, 22 years of age, from Kafr Malik, north-east of Ramallah. The Israeli military invaded the village on June 14 2015 in order to capture and hand over one of the inhabitants to its intelligence forces. During this operations, Abdullah hit by a military jeep that was travelling at high speed. The jeep then proceeded to deliberately drag his body along as he hang on for 6 meters. When the jeep eventually stopped, the victim crashed against a wall and left there for three hours, during which he eventually bled to death. Occupation forces suppressed the weekly marches and at the entrance of Jalazoun, north of Ramallah. Bassem Anas Abdul Aziz Qasim, 50 years old, was wounded by a metal coated bullet in his right hand, with his wife sustaining minor injuries in her face when an Israeli soldier shot at their car from only two meters away whilst they entered the Jalazoun refugee camp during the weekly march. A 20-year-old Palestinan was wounded by a bullet in his right foot during his participation in the march in Silwad, north-east of Ramallah. Five Palestinians were wounded with live ammunition, two of whom are in serious condition, during the brutal repression by Israeli military forces of the weekly march in Kafr Kaddoum. Mohammad Majid was wounded by two bullets in the abdomen and in the chest and remains in a critical condition, Ibrahim Mussa, aged 35, was hit by a bullet in his stomach whilst in his home, Mohammad Nadal, aged 20, was hit by a bullet in his foot, Iman Farouq, aged 38, was injured by a Additionally, dozens of activists and villagers have been injured by suffocation as a result of the Israeli soldiers firing tear case at a number of marches in Bil’an, Nil’in, Al-Moasra, Nabi Salih, Kafr Kadoum, Salwad,Jalzoun Refugee camp and in the vicinity of Ofer prisons and others. On June 13 2015 the Israeli occupation forces stationed at the border in the Gaza Strip opened fire and injured a boy, Hatem Saleem Musa Abu Moere, 18 years old, in his lower limbs and arrested him whilst he was in the Al-Nahda neighbourhood, east of Rafah. This was carried out under the pretext of him approaching the border, aware that he suffers from mental disability and mobility issues. In a separate event on June 11 2015, the Israeli navy boats stationed of the coast of Deir Al-Balah opened fire at three Palestinian fishing boats, chasing them for two hours before cutting the fishing nets of eight fishermen and confiscating 53 fishing nets. On June 16 2015, the Israeli occupation forces opened fire at eleven Palestinian boats in the same area. In this context, it is important to note that there are important marine gas fields are situation offshore the coast of Gaza. Israeli forces carried out 59 raids and incursions in the West Bank, aimed at arresting Palestinians and inspecting their homes, which would naturally result in the delivering of Palestinians to their intelligence forces. The incursions and raids are divided into the following: 23 incursions in Hebron, 13 in Ramallah, 5 in Jerusalem, 5 in Jericho and the Jordan Valley, 4 in Jenin, 4 in Qalqilya, 3 in Bethlehem and 2 in Hebron. This campaign led to the arrest of 43 individuals, amongst them ten minors and three women.14 of whom were summoned by the Israeli intelligence forces. The arrests carried out are divided as follows: 14 people in Jerusalem (amongst them 6 minors and 3 women) 8 people in Hebron (amongst them 2 minors), 6 in Ramallah (amongst them a minor), 5 in Bethlehem (amongst them a minor), 4 in Jenin, 3 in Qalqilyah, 2 in Nablus and 1 in Tulkarem. The Israeli intelligence forces summoned the following number of Palestinians: 11 in Hebron, 2 in Ramallah and 1 in Bethlehem. On June 17 2015, bulldozers belonging to the occupying Israeli municipality destroyed, without warning, a house in Beit Hanina, north-east Jerusalem, belonging to Tamer Jamal Idris in Morouha. The family was unable to remove furniture before the house, measuring 60m2, was torn down. On June 11 2015, a group of settlers attacked and severely beat up Jerusalemite Shadi Ahmad Abd-Rabouh, 18 years of age, from Mount Scopus whilst he was at work inside a restaurant, west of the city. 16 settlers broke into the restaurant and directed profanity and insults at Arab workers, before brutally attacking Shadi. One of attackers attempted to strangle Shadi, who had to be taken to hospital for treatment. Israeli bulldozers embarked on razing approximately 20 dunums of agricultural land, planted with almonds, grapes and olives. On June 11 2015, more than 60 trees on agricultural land were uprooted between the settlements of Beitar Illit and Tzur Hadassah in the Palestinian village of Wadi Fukin, west of Bethlehem. The aim is to create a trade route between the two settlements as well as to establish a new neighbourhood in the area around Beitar Illit. In another incident, the Israeli occupation forces embarked on military training using live ammunition which burnt tens of dunums of agricultural land in Aldawa, east of the town of Aqraba south of Nablus. In addition to this, settlers fired at herds of horses and cattle on land behind the Wall between Salfit and the Ariel settlement, damaging dozen of olive seedlings and partially damaging olive trees. On the same day, the Israeli occupation forces destroyed tents belonging to the Abu Qabeita family, in the area of Asitar south-east of Yatta, under the pretext of ‘security concerns’. The occupation is working to displace the population of this region for the benefit of the settlement scheme, which aims to seize 15 villages from its rightful owners. In another event, the Israeli occupation forces evacuated 30 families in the Jordan Valley area to embark on military training. On June 15 2015, the Israeli occupation forces confiscated vegetable and fruit stands on the 60 bypass road, where Palestinian farmers sell their products. On the same day, the Israeli occupation forces bulldozed cabins that are used as a carwash facility in the village of Firdous, east of Bethlehem. Israeli forces also proceeded to uproot 20 dunums worth of land, planted with olive trees as of 3 years ago, in the village of Husan, west of Bethlehem, before arresting the owner. Furthermore, the same day, the occupation forces bulldozed an area of land measuring 10 dunums owned by the farmers from Yanoun and Tana, south of Nablus, which have been blocked off from their owners by concrete blocks and dirt. In the plains of the village of Jalud, south of Nablus, occupation troops confiscated a tractor and harvesting machine. Settlers also surprised the owner of the land and vandalised 30 dunums of grazing land for sheep and horses. On the same day, a group of settlers set fire to land owned by Mohammad Jabara in the town of Kafr Al-Labad which destroyed the entire wheat crop. On June 16 2015, Israeli bulldozers destroyed hundreds of forest trees in a natural reserve measuring 300 dunums, east of Tubas. In the Gaza Strip, for nearly 8 years in a row the occupation forces have persisted in a tight land and sea blockade, which has isolated the Strip completely from the West Bank and the outside world. This is a blatant violation of political, economical, social and cultural rights and is exacerbating the living conditions of approximately 1.8 million civilians. Unemployment has been on the increase as of recently and has reached 43.9%. Another result of the siege is the rising poverty rate, which has reached 38.8%. 21.1% of the people in Gaza suffer from extreme poverty. Because of the siege, many Gazans are deprived from any form of communication with their friends and family in the West Bank and abroad, in addition to hundred of students being prevented from attending universities in the West Bank and occupied east Jerusalem. These indicators demonstrate the unprecedented economic decline of the population in the Gaza Strip. In the West Bank, the Israeli occupying forces continue to obstruct the freedom of movement for the Palestinian people as well as goods due to the practice of implementing ‘flying’ (temporary) checkpoints on many different roads and in different districts. This of course is in addition to the permanent checkpoints. Furthermore, acts of brutality and degrading inhumane treatment are used at all checkpoints to ambush Palestinians and arrest them. Daily arrests are carried out at checkpoints and crossings in the West Bank. 26 ‘flying’ checkpoints have been set up and were distributed as follows: 10 in Hebron, 10 in Ramallah, 3 in Jericho and 3 in Qalqilyah. In the framework of this policy, the use of these military checkpoints and border crossing can be likened to a trap in which Palestinians are arrested. During the period in question, the occupation forces arrested 6 Palestinians at checkpoints or crossing: Abdul-Lateef Salaameh, 32 years of age, from Al-Aroub camp, lawyer Ayyad Hussein Hassan Khalil, 35 years of age, from Beit Ummar, a Palestinian, 32 years of age, from Kafr Kadoum, Nasser Abdul-Rahman Abdullah Wahan, 30 years of ages, from Tubas, Ahmad Muhammad Murshid Za’qiq, 28 years of age, from Beit Ummar and Mahmoud Muhammad Adaa Wara, 24 years of age, from Askar refugee camp.